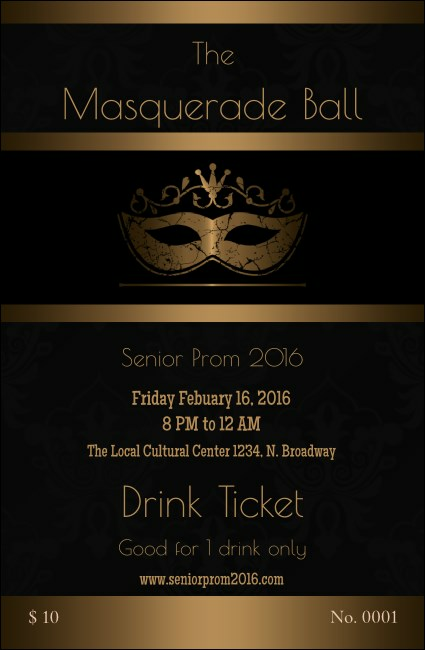 Make sure there’s a glass of champagne in every hand by gifting Masquerade Ball 3 Drink Tickets to every guest. Inspired by the spirit of a classic, New Orleans Bal Masqué, this drink ticket template’s sophisticated design presents your event’s information through ten available text lines. Unique numbering and barcoding aid with security. Measurements are 2.71" x 4.14”, approx. Keep the libations flowing and lines at the bar short with the help of TicketPrinting.com drink tickets.